The new year is upon us. We will be open our normal 24 hours on New Years eve, New Years day and Monday January 2. Have a safe and Happy New Year everybody! It is that time of year to think of others. A Fleetwood Diner gift certificate is a great way to show someone your thinking of them. Available in any denomination and redemable anytime at the Fleetwood Diner in Lansing on Cedar St.
Hello and welcome to our new online home. We are so excited to bring our menu to all of our great customers on our new website. Please check out our Lansing and Ann Arbor menus. We want to thank everyone for there support during the construction on Cedar Street, Lansing. It is finally done and we are breathing a big sigh of relief! We hope to see you soon so you may experience some of our new menu items first hand. Please check back with us on a regular basis for news and updates. We will keep our online menu up to date and let you know about any specials we are promoting. And before you leave our website, be sure to visit us on Facebook and LIKE us to receive coupons, commentary, and more. 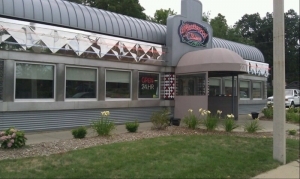 Did you know that Fleetwood Diner is open 24 hours – 7 days a week? Stop in any time for quality homemade food all week long.